Before we talk about angels in heaven, let us describe what heaven is. Many mystics both past and modern agree that heaven is not an actual place. It’s not something out there, beyond our reach. Heaven, they argue, is a state of consciousness. And we can experience it right where we are. Heaven is all around us, they say. Yet others say that heaven is another dimension. However, it is interwoven with our world. So in a way, heaven coexists with the physical plane and it also permeates the unseen planes. People who have had a near-dear death experience say that they have had a glimpse of heaven: it is a beautiful "place" where they meet their deceased loved ones. There, they claim, everyone is happy. According to their accounts, people over there devote themselves to learning and helping others, and have a better understanding of the meaning of life. So what is heaven? I agree with the mystics and seers who claim that heaven is a state of consciousness. And many of us have experienced heaven here on Earth: we have experienced heaven when we fall in love, when we look at a newborn baby, when the beauty of a sunset takes our breath away. Maybe you are familiar with the typical view of angels in heaven, sitting in puffy white clouds while they play their harps. Heaven is the abode of angels. However, they are never idle. They are busy doing God’s work. 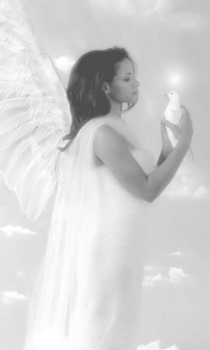 And even though angels live in a perfect state of consciousness (heaven), they are always with us. We may not see them, but they never abandon us. Angels are, so to speak, divine intermediaries. They move freely from one world to the other, sometimes as messengers, other times as protectors. 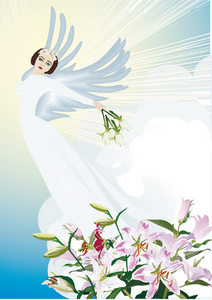 Below you will find artistic depictions of heaven angels.